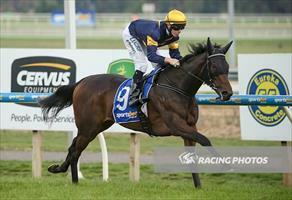 Lilymorn was expected to run well and the daughter of Rip Van Winkle delivered at Ballarat on Thursday. Patrick Moloney was able to dictate from the front on Lilymorn and although pressed hard late, the four-year-old had enough in hand to win the Fillies and Mares Benchmark 64 Handicap over 1400m. narrowly. Moloney said he was expecting to take advantage of barrier three and press forward. “I thought she might have sprinted a little bit better being fresh when I asked her off the bend but she was very strong,” Moloney said. “She was stepping up in distance and she was in front where it counted. “I was worried she might be vulnerable late as she’s still got some improvement in her but she did it really well.